One of the things I like to do when I get a new book is to get the measure of the thing. I like to look the whole book over, skim through the pages, get a feel for its girth, its style, its feel. This is particularly the case with poetry. I like to orient myself to the book and have a few tasters before I go in again more slowly, taking each poem in turn. That’s what Poetry Monday is all about: the initial reading before the reading. I also like to think of it as my little own version of “gathering paradise”, to steal a phrase from my favourite poetry site PoemTalk, where it was nicked, of course, from Emily Dickinson’s “I dwell in Possibility”. It’s a little bit of poetry paradise into which I’m about to immerse myself. As the author of some 75 (!) books of poetry, fiction, nonfiction, translation and criticism (the number continues to grow), Ouyang Yu’s literary influence is undisputed. I interviewed Ouyang Yu back in 2007, after he published his book On the Smell of an Oily Rag. During that time, he told me that the wasn’t in the habit of putting himself into pigeon holes: "I might as well call myself a poetnovelisttranslatoressayistcritic". I think that label, if one were required (of course it isn’t), could be applied to his new book Fainting with Freedom. Many of the poems read like little stories or narratives, full of (often subversive) fun, dismay, intensity, longing, and Ouyang Yu’s characteristic word play that always breaks linguistic boundaries. Full review, as always, to follow. Continuing on from the last Poetry Monday post, I thought I’d post up my second ModPo essay. Again, this is is the second time I’ve written on this poem, but I haven’t pulled out my old essay (not sure I’ve kept it), and as it has been some years, I have come at this task with beginner’s mind. I found this essay to be a relatively easy and enjoyable one to write (much easier, for example, than the poetry book review I’m working on - a wonderful but slow and complex read). The process of writing this has helped me clarify not only the principals of Imagism which we’ve studied, but also allowed me to trace the transition of a poem from good to excellent. Feel free to add in your own essays, responses and comments. There has been much written about William Carlos Williams’ “Young Woman at a Window”, and while we know that second version is the one that Williams ultimately published, it is fascinating to trace the condensation from the first poem to the second, and to explore why the second poem not only adheres better to the imagist manifesto, but is also objectively speaking, a more powerful poem. 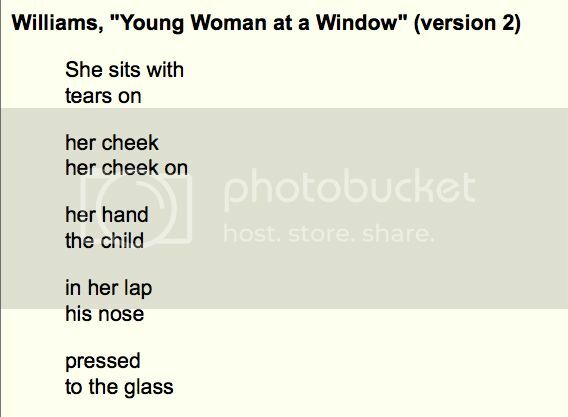 While both of the poems feature the same objects: a woman and a child at a window, and both have similar structures and the same number of stanzas, the second version has been reduced to 23 words from 29, with a more even cadence and couplets, beginning and ending with 3 words. The first version is more narrative, leading the reader towards a sentimental conclusion. The second version of the poem allows the reader to make his or her own inferences, leaving the image clear of inference. In version 1, specific words and sentence structures are used to evoke sentiment. The reader is told that the child has “robbed” the woman, and is unaware that he’s done this. Also the child rubs his nose – an unappealing act linking the woman’s tears to the boy, and something about the demands of parenting. That the boy needs his nose wiped becomes the denouement for the poem. In addition, the delicate early rhythm of the poem and its first word repetition is marred by words like “this”, “who,” and “knows” which break the cadence with sentence structure type inclusions that further progress a narrative. 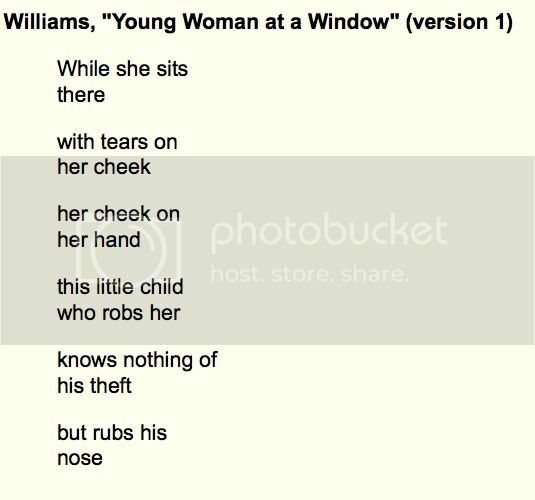 In the second version of the poem, Williams has condensed the image and removed extraneous words or “vague generalities” like ‘robbed’ and ‘knows nothing’, and actions like ‘wiped his nose’. Instead the image is static—frozen in time like a statue, and is rather more beautiful as a result. There are no runny noses here or self-pity. The reader is confronted with, in the words of the imagists, an “exact visual image” which makes its statement completely. The reader is left free to make inferences about the nature of the tears, about the symbolism of the window which hints at inside versus outside without stating it overtly, and about the reason for the two sitting together in such a pose. Though there is no expression of ‘robbery’, the image is suffused with sadness and longing, but only by virtue of the imagery. Ending the poem on the word “glass” creates a perception of being cloistered, without the need to state it. Finally, and perhaps most importantly, the second poem not only uses the image itself to convey meaning, but it is structurally and rhythmically aligned, using repetition and alliteration of the words “her” at the start and “on” at the end of the first three stanzas, and the sibilance in “nose”, “pressed”, “glass” which convey both silence and tears. This poem works perfectly when read out loud, encouraging the reader to just look, to just feel and just participate directly in the subtle longing and sense of cessation conveyed by the poem. Those of you who have followed this blog for a while (or who know me) know that I’m a massive fan of the annual event known as Modern and Contemporary American Poetry or ModPo run out of Coursera by the University of Pennsylvania. The event masquerades as a course, run for 10 weeks by the amazing Al Filreis and his exceptional team of Teaching Assistants and Community Teaching Assistants. You can certainly attend, get your certificate of attainment (or just follow along), and go on your merry way at the end of it (with a totally new approach to reading and appreciating poetry that extends way beyond the syllabus) - that’s enough of course. For me and many others, once is just not enough. The course has become an annual excuse to revisit some of the most seminal poets of all time, to do close, but not too close, readings of some exceptional and challenging poetic work. 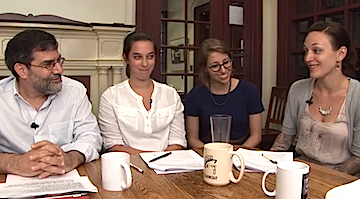 Al has encouraged former students to come back and keep playing every year, through new material, through mentorship opportunities, new live ‘meet-ups’, new opportunities for interaction, and new approaches. Though the numbers get larger each year, the intimacy somehow seems to grow too. This year, there’s a new section for those who either want something a little different or who want to go further and deeper into the work. It’s called ModPo Plus and it features complementary poetry and its own discussion forum. Since I’ve done ModPo before, I’m working through all of the normal ModPo material and all the poems in ModPo Plus but focusing most of my discussions around the ModPo Plus material at the ModPo Plus forums. Most of my essays will have the same topic as they have in previous years, but I’m enjoying revisiting the work and coming to it with beginner’s mind - maybe going just a bit further as I explore my assignment topics. I thought it might be fun to post those essays up here. Please feel free to put your own thoughts or essays into the comments. I like the idea of these discussions spreading outwards and repeat ModPoers are encouraged to facilitate that. Oh, and if you want to join ModPo it actually isn’t too late. You can’t get a certificate as the first assignment date is passed, but you can jump right in at Gertrude Stein and join in now. The community is very warm and inclusive and nothing is mandatory. Of all Emily Dickinson’s poetry, “I taste a liquor never brewed” is one of the most exuberant, piling image upon image in an extended metaphor. This poem is somewhat less condensed than much of her other work, freed from constraints by the drunken slur of dash and the repetition of exclamation mark. The quatrains use a ballad form but only rhyme the second and last word of each stanza, and the initial rhyme (“Pearl” and “Alcohol”) is off, which adds to the slightly arrhythmic, wild feel as it flows from first taste to the full satiation of inebriation. In the first stanza we we’re introduced to what the poet is drinking: a rarified drop, stronger than any produced in the famous Rhine wineries. This ‘drink’ is delivered from “Tankards scooped in pearl”, which is more evocative than specifically semantic, but suggests something like a large shell (mother-of-pearl lined), or perhaps a cloud formation with the sun shining behind. This intoxication comes from the exquisite beauty of the natural world (eco-poetics at its best). There’s a sense in the second stanza, through rhythm, image, and punctuation, of a little subversiveness. The poet has become debauched and drunk, though not on brewed liquor, but on air, on dew, and on the blue sky of summer. Each dash functions as a pause or even a hiccup, coupled with extensive alliteration to create the rhythms of drunkenness that invite the reader to also partake. The multi-sensual impact of a blue sunlit sky captured with such precision in “Molten Blue”, provides both warmth and visual appeal, but it’s more than the flower, the sights and scents of a striking summer day. It’s the impact of that day on the poetic imagination that turns it from a moment of experience to something permanent. This is the creative flow or wellspring that the poet taps into (to keep the liquid metaphor going). It is Emily’s meta-poetic implication that turns this otherwise heady pastoral poem into something quite post-modern. The extended metaphor of a drunkard at the inn is stretched further in the third stanza, as day becomes night and the poet continues the creative spree. The landlord might be the foxglove itself, closing petals so that the bee and butterfly, that have had their fill of sweet nectar, can drink no more. For the poet, the “high on life” inebriation doesn’t end because there’s always more beauty in the endless creative flow in this figurative inn where the tap is always open. The final stanza shifts from the nature metaphor into a more frigid heavenly one, away from the immediacy of sensual pleasure. From these lofty heights, beyond the window, an angel (“Seraphs”) or teetotaler saint might look down from a frosty (“snowy Hats”) heaven and disapprove of such excesses of sensual joy. The reader too, who has been encouraged in the first three stanzas to partake, might disapprove of such poetic licentiousness. After all, this is the full sensual experience – sight, sound, smell, touch and taste are all evoked in a reeling swirl that is quite overwhelming. Of course, we might just join in in this moment of creative power and shared delight and let ourselves be seduced. The October Compulsive Reader newsletter has just left by owl, and should arrive in your inbox shortly. By way of a preview, the newsletter contains the usual bevy of 10 fresh reviews and interviews, including my own long overdue review of Ali Alizadeh's Iran, My Grandfather and Fiona Wright's Small Acts of Disappearance. We've also got Nicole Trope, Lee Holmes (it's all about the gut), Lars Gustafsson and Agneta Blomqvist, and much more. If you haven't kept abreast of all the literary news this month, don't fear, because I've got a very thorough global round-up including the new Ritchell prize longlist, Mao Dun Literature Prize, The Scotiabank Giller Prize, and on it goes. If that doesn't entice you, we've got 3 new giveaways, including the 200th limited edition anniversary version of Austin's Emma. If you aren't subscribed, you should be! Just go to The Compulsive Reader and sign up. It's free, you just get one newsletter a month, and it's a fantastic community of book lovers. We'd love you to join us.